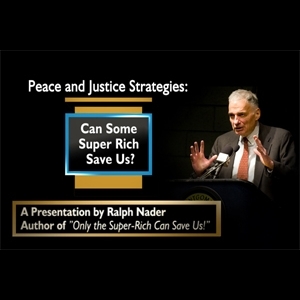 Peace and Justice Strategies: Can Some Super Rich Save Us? Montgomery College Television Arts & Humanities	 Recorded February 16, 2010. Ralph Former presidential candidate, social critic, consumer advocate, activist, lawyer and author, Ralph Nader, presents ideas from his newest book “Only the Super-Rich Can Save Us”. This Event was sponsored by the Montgomery College Peace and Justice Community and made possible through a Make it Happen! Innovation Grant. Recorded February 16, 2010. Ralph Former presidential candidate, social critic, consumer advocate, activist, lawyer and author, Ralph Nader, presents ideas from his newest book “Only the Super-Rich Can Save Us”. This Event was sponsored by the Montgomery College Peace and Justice Community and made possible through a Make it Happen! Innovation Grant. Embed "Peace and Justice Strategies: Can Some Super Rich Save Us?" on your page.